Recently, the answers of a test held nationwide were leaked to a group of unscrupulous people. The investigative agency has arrested the mastermind and nine other people A, B, C, D, E, F, G, H and I in this matter. Interrogating them, the following facts have been obtained regarding their operation. Initially the mastermind obtains the correct answer-key. All the others create their answer-key in the following manner. They obtain the answer-key from one or two people who already possess the same. These people are called his/her sources. If the person has two sources, then he/she compares the answer-keys obtained from both sources. If the key to a question from both sources is identical, it is copied, otherwise it is left blank. If the person has only one source, he/she copies the sources answers into his/her copy. Finally, each person compulsorily replaces one of the answers (not a blank one) with a wrong answer in his/her answer key. The paper contained 200 questions; so the investigative agency has ruled out the possibility of two or more of them introducing wrong answers to the same question. 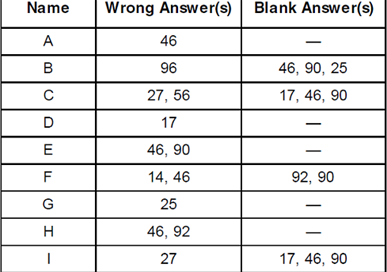 The investigative agency has a copy of the correct answer key and has tabulated the following data. These data represent question numbers. E introduced the wrong answer to question 46. F introduced the wrong answer to question 14. H introduced the wrong answer to question 46.